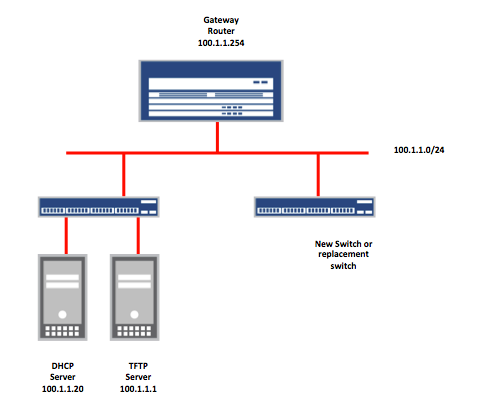 The Network Arborist: Use Zero Touch Provisioning (ZTP) to auto-configure and upgrade new or replacement switches in a datacenter. Use Zero Touch Provisioning (ZTP) to auto-configure and upgrade new or replacement switches in a datacenter. A Typical Data Center can host 10s if not hundreds of Top of the Rack (TOR) Switches. Managing and configuring each one of these can become a tedious task. Replacing a switch that goes out of service is just as time consuming. ZTP is an automation method that reduces the amount of time, minimizes errors and the need for a Network Engineer to be on location. You would only need a junior engineer or technician to re-cable links, rack the units and power them on without having to console in or add any configuration. ZTP uses a combination of DHCP and TFTP/FTP/HTTP servers for dynamically allocating ip addresses, uploading configuration and upgrading switch software images. Juniper EX and QFX switches automatically default to ZTP on boot up and basically become DHCP clients. To start you would configure a DHCP server, modifying the dhcpd.conf file by adding a few options: DHCP option 43 with vendor specific information sub options and DHCP option 150 or 66 which contains the address of the TFTP server. On the TFTP or FTP server you would archive all your switches' configurations and software images. ZTP works on untagged interfaces on any ports on the switch (data ports or management ports). Auto Image Upgrade: DHCP OFFER Client vme.0: Invalid config, no file server information. OFFER REJECTED. If no server is reachable it will try all the interfaces that are up on the switch using the default vlan and a temporary irb. It will then check the DHCP Options that are passed between the server and the switch, noting the TFTP server IP address, the configuration file name and software image to be installed. Auto Image Upgrade: To stop, on CLI apply "delete chassis auto-image-upgrade"
Auto Image Upgrade: Interface:: "irb"
Auto Image Upgrade: Server:: "100.1.1.1"
Auto Image Upgrade: Server File:: "PE3713320070.conf"
Auto Image Upgrade: Gateway:: "100.1.1.254"
Auto Image Upgrade: Protocol:: "tftp"
The EX switch will then download the config file and the software image. If the installed version on the switch and the version on the tftp server are the same, then the upgrade process aborts. If the images are not the same, the EX switch will auto upgrade. The EX is now running the new version of code and the downloaded configuration file and is ready for production. Here's the config I see on the switch after reboot. It matches the config I saved on the TFTP server. # DHCP IP Pool for your PCs, etc. This is a very good doc for hands-on.